A digital strategy is not just the result of various operations – a good website, presence on social media, a newsletter schedule and so on – but a sophisticated plan of separate yet interacting activities. Because nothing can be effective without a well thought out strategy that draws on skills and tools. Today we’d like to guide you through the five main areas of digital marketing to take a look at its key features and give you some pointers. These are free tools with huge potential: you can identify keywords and trending topics to hone your activities. Making improvements means knowing your field (benchmarks, models, goals, competing companies). That’s why staying up-to-date on news and trends in your sector – to take advantage of them for your own product – lets you boost the perception of your brand and positioning through connections with widely searched topics. By optimizing the meta title and meta description. Automation is not just technology that saves you time by automating the communication flow; it is a key tool for targeting and personalizing content. Developing a marketing automation strategy means using the customers’ behavior and personal data to send them multi-channel email and SMS campaigns that are always relevant and tailored to their specific needs, interests and habits. Marketing Automation technology is key for cultivating every stage of the customer journey – from registration to the first purchase, through to loyalty strategies – and is available to everyone: to develop a workflow, it just takes a few drag & drop operations. 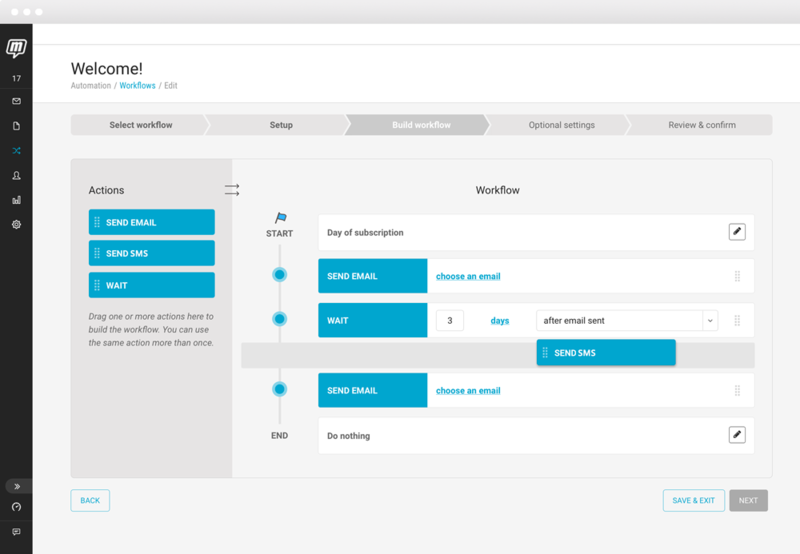 MailUp 9 gives you the possibility to add SMS to workflows, as well as emails, so you can set multi-channel campaigns to send automatically. Understanding the interests, tastes and habits of the people we want to target is our main task. Start out by deciding the key demographics of your target audience: age, gender, occupation, income, hobbies and interests. Once you’ve tracked 3-4 types of user models, you can develop finer and more accurate profiling. This is an essential tool for having an overview of your content and understanding which of it deserves further development in terms of investment and creativity. Content is the result of a successful company strategy. Always opt for quality with up-to-date and original content (as we said before, this is also crucial for SEO). Here are a few examples: Blog posts, galleries, eBooks, white papers, guides, infographics, videos, case studies and so on. Only spend time with the social media that can give you a real advantage. So before committing to multiple social networks, find out which channels your model target is most active on, so you can tap into a well-defined community. Improving means knowing the strengths and weaknesses of your previous activities and campaigns: you’ll get a lot of help from the Analytics of each individual platform (Twitter Analytics, Facebook Page, Audience and Domain Insights) as well as Google Analytics. A study in Aberdeen tells us that brands that use video boost their revenues 49% faster than those that don’t. What’s more, it is estimated that in 2017, video advertising will count for 69% of consumer-dedicated traffic. Once again, the race to video content marketing must not come at the expense of quality and relevance. Behind the creation of a video, there are a range of technical and writing skills involved: before shouting “action”, you need to develop a storyboard to identify and anticipate your audience’s needs and interests. In a Video Content Marketing strategy, the landing page proves to be a fundamental tool that can bring in conversions. Here’s an example from a simple and efficient Adobe Creative Cloud campaign. This is not an addendum to the strategy, but an integral part of it: analyzing your results lets you focus on what’s working to further improve your performance, and what’s not, so that you can change some features or drop them altogether. A data-driven approach saves you time and money, as it lets you better identify your real target. Especially given that achieving customer loyalty – i.e. of a well-defined target – costs 5-10 times less than acquiring a new customer (PricewaterhouseCoopers). For all email marketing metrics or KPIs (Key performance indicators as a measures of success), we recommend reading this post: 10 points to stop making “spur-of-the-moment” decisions and learn how to identify, monitor and analyze the right metrics.